Hello! Welcome to the PMS Release in Review! For the next 3 days we will be reviewing our recent release. All of the stamps you will see are now available on our site. You can see the entire release HERE. 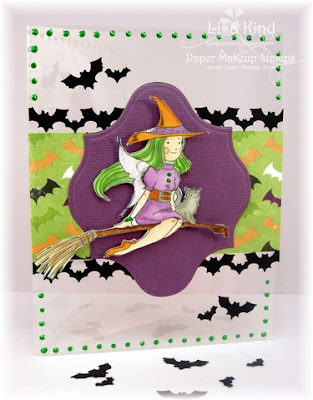 Today we are reviewing the October Halloween Kit! 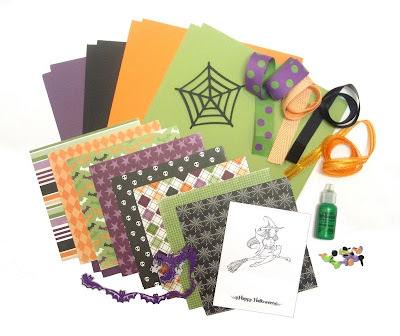 In the kit you will get eight full 8.5x11 sheets of colored cardstock that coordinates beautifull with eight 6x6 sheets of double sided patterned paper from Echo Park's halloween collection. You will also get 16 sugar coated brads from doodle bug and 4 yards of awesome ribbon from May Arts and Offray. You will also get 18 inches of self adhesive felt bads by Queen & Company. You will get 1 die cut spider web and 1 bottle of emerald green liquid pearls by ranger. Last but not least, included in this kit is 1 awesome witchy fairy and a happy halloween sentiment. Now, as you may remember... we had a slight delay with the stamps for the kit. Very frustrating for everyone! Our replacement stamps will be arriving next week and those will ship out to everyone who has already purchased the kit immediately. Still, if you order the kit, until we recieve the stamps, your kit will be mailed to you with a digi version of the stamps so you can get started right away and then the rubber stamp will be mailed to you as soon as it is in at no additional cost to you of course. Because some expressed interest in just purchasing the kit with digi versions of stamps at a discount, we thought, well why not! So there are 2 versions of the kit available, if you'd like a discount and a kit with digi stamps only, purchase that one HERE. If you want the version with rubber, click HERE. And last but not least, if you are wanting the withy fairy as a digi without the kit... well for a limited time we're going to offer that too! I know, we're a little crazy! Here is a link for that. And now... on to some stellar examples from the Senior Paper Makeup Artists using the kit! 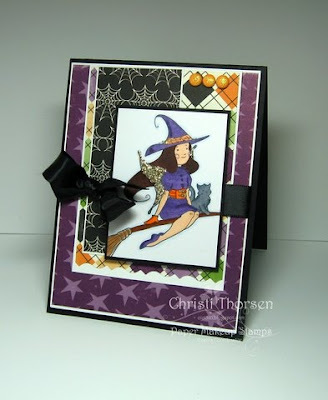 Have a wonderfully witchy day!